During my consultation with Tracey, she expressed the following concerns. Before I go into all the ways that I helped fix Tracey’s dry, flaky skin on her face and other areas, it’s important to know that depending on your skin type, you may have either dry or dehydrated skin. It’s important to know the difference between these. Read this post. Your skin has a barrier made of natural lipids that help keep moisture in and irritants out. When this barrier is damaged (due to age, hormones, genetics, incorrect products and more), it creates tiny, invisible cracks in the skin. These cracks allow moisture to escape, causing dry, flaky skin on the face and elsewhere. Also, irritants then enter more easily. This makes even sensitive skin products cause a stinging, uncomfortable sensation. This sensation might not normally occur if the skin was in a healthy state. 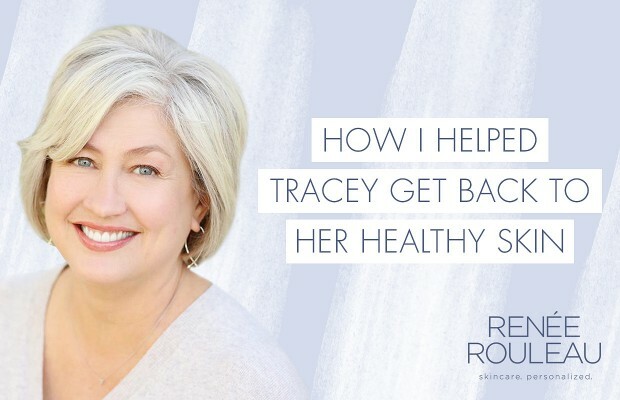 In the case of Tracey’s skin, all the moisturizer she was slathering on wasn’t doing anything to help. Her skin’s moisture barrier was in desperate need of repair. How to fix a damaged moisture barrier causing dry, flaky skin? There are so many things you can do. The sooner you start, the quicker you’ll see improvement. It’s important to know that it can take up to three weeks to notice a visible difference, but the dry, red skin should feel better quickly. Avoid washing your skin with anything that leaves it feeling tight. It’s been proven over and over that the ingredient vitamin C effectively protects skin cells from environmental damage. However, for red, sensitive and easily-irritated skin types, you need to be very careful about which type you use. Many vitamin C serums are too acidic and can be very reactive for those with a delicate barrier. There are two general categories of vitamin C serums. This means the product won’t discolor. It won’t break down and lose its effectiveness over time, so it’s good to the last drop. This means the product will turn dark yellow or golden brown over time. Air oxidizes the formula, resulting in fewer skin benefits. This unstable type, due to its acidic nature, can cause stinging when applied. This then results in irritation, especially for sensitive skin types, and retinol/prescription retinoid users, and those who exfoliate their skin regularly. The one that I recommended for Tracey was Vitamin C&E Treatment. 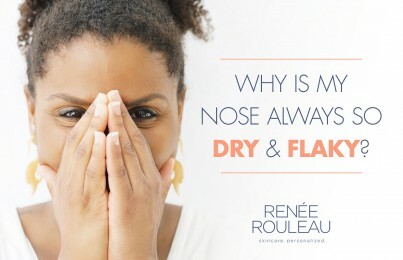 It’s a stable, no-sting, non-irritating formula that delivers the best and safest results for her dry, sensitive skin. To further understand the oxidation process and unstable vitamin C, think about If you take a bite of an apple and set it down on a table. What will happen? it will start to discolor and turn brown within 20 minutes. This happens because the air is oxidizing the apple. (Check out this cool experiment I did with an apple and a vitamin C serum.) When you’re using an unstable form of vitamin C, it can quickly oxidize on the face. This means it has started to lose potency and your skin may not be reaping all its benefits. Wearing a broad-spectrum sunscreen every day is a must. UV rays from daylight cause inflammation in the skin which only makes sensitive skin more reactive. Apply a generous coat to the face and neck every day under makeup. Weightless Protection SPF 30 uses zinc oxide, which is known to be a calming anti-inflammatory. This makes it ideal for sensitive, easily-irritated skin. Be sure to use products for your skin type..
From the very start of my esthetics career, I learned that every skin is unique. The ‘one-size-fits-all approach’ is simply not effective in achieving healthy, balanced and beautiful skin. Classifying skin into the standard oily, normal and dry skin types is just so limiting. Many cosmetic companies still say, “this product is for all skin types” but all skin types have such different needs! I believe there are nine different types of skin. My skin type quiz will let you know exactly which one you are. (However, more than likely if you’re reading this post, you’re probably a skin type #5 or #9.) Take my Skin Type Quiz to find out yours. I recommended that Tracey purchase skin care products formulated for skin type #9. She was apprehensive about purchasing the complete collection, as she has experienced so many false promises from other skin care professionals and salespeople. However, I’m thankful that she trusted me because she felt that I really understood her skin and the underlying cause of her concerns. 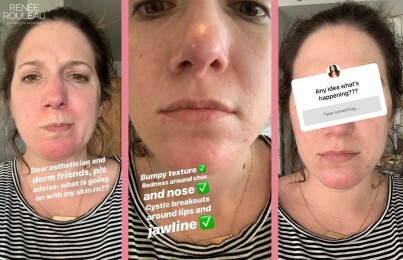 I will say that I definitely suggested she introduce the products slowly by only using one new product every few days. (Read how to introduce new products to your skin.) To start, I suggested for the first few days that she use Phytolipid Comfort Creme and add a few drops of Pro Remedy Oil to it. When I checked back in with her a month later, her dry, flaky skin on her face and other areas had improved so much. The combination of the products had improved the redness and dryness dramatically, and she was so happy with the results. Her skin felt less warm to the touch, and she didn’t have that feeling of constant irritation. She is a loyal and happy lifelong client and has referred so many of her friends and colleagues to us through the years. Thank you, Tracey. I knew my trusty magic skin wand would cure you—without you having to resort to harsh prescriptions! Hi! I am a 19 year old girl and have had a lot of problems with acne. 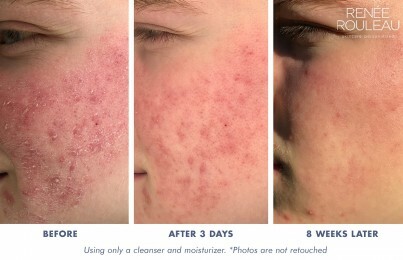 About a year and a half ago I was recommended by a friend to try the PanOxyl acne treatment wash (in maximum strength: 10% benzoyl peroxide) as it had worked wonders on her skin. I used it on my face and some on my chest and shoulders. However, my skin is very sensitive, and after a while I noticed that the skin on my chest looked burnt. It was completely red, looked like a terrible sunburn. It was very painful and I had to wear light clothing and prevented carrying backpacks as it hurt too much on my skin. At this point I quit using the wash on my chest and shoulders, but was dumb enough to continue using it on my face for another month or two. After a while I started seeing the same thing happening to my face. It looked red at all times and it got very dry and flaky. At this point I threw away the wash and have never used it since. However, now that it has been more than a year since I stopped using it on my face, my skin is still damaged. It is red at all times, it gets super dry and flaky, and it feels like a terrible sunburn 24/7. It hurts so bad it keeps me up at night, the best way to describe the feeling is a flame coming out of my face. Touching it or even washing it with water hurts sometimes, and all types of washes and creams for sensitive skin, even all-natural creams, hurts so bad I can barely put them on. I use thick face creams from the pharmacy at night, but I still wake up with flaky skin and it often feels like my whole face is peeling off. Do you have any suggestions for me? I have become pretty desperate at this point. I find it weird how my skin is still damaged more than a year later as I have not used any harsh products on my skin ever since, especially as my chest and shoulder-area healed after a couple weeks. Should I go see a skin professional or would skin treatment products like yours help me? Would be so thankful for a response! Thank you! Your moisture barrier may be damaged so it’s important to build that back up again by using the right combination of products. I would suggest that you get on a really good skincare routine focused on repairing your skin. But yes, my line would be perfect. Yes, our products are definitely great to use for men. Im 24 years old. I have skin type 9.i have tried almost everyrhing clinique,sebamed and other local brands. All these peoducts claim to work nicely but at the end it leaves my skin irritated. I think your products can work for my skin. Do you ship to India? Yes, we definitely ship to India. The cost is $39.95 USD. You will love our line of products! I’m really not sure of my skin stype so I was hoping you could possible steer me into the right direction. I’m 33 with fair/light skin. I do have whiteheads and blackheads in my tzone only. If I use a cleanser for oily skin it will leave me tight and flaky. I have a lot of redness/darkening and was told I have rosacea but the products to treat it just irritated my skin. There was really no differnce when using the products and when not using them(and I gave it a year.) After reading your post I feel like my barrier is what may be the problem. Everytime I go to the derm they just want to put me on meds that just make everything worse. I have tried gentle cleansers such as Cerave Hydrating cleanser but if I use it a coulple days in a row it causes me to dry out and sometimes stings. I also use a cleanser with salycilic acid but I find that it to can be too harsh. I feel like my skin is really needing some tender care to help it heal. I don’t think I should “feel” my facial skin being irritated. Which Skin Type would I be in? Could it be that I need to give the Cerave Hydrating cleanser time to work and that maybe it just dries me out now due to my skin being fragile but once i continue to use it it would repair my skin and help it heal?? Thank you…. It definitely sounds like the cleanser simply isn’t a fit for your skin so I don’t think you should give it more time, plus there is nothing in it that’s particularly calming and that’s what your skin needs right now. It does sound like we need to focus on strengthening your barrier as that in general, will allow the skin to be less sensitive over time. As for rosacea, yes, so many people experience problems with meds making their skin even worse so that’s not a good plan. I think you should do the skin type 5 but change out the Gentle Gel Cleanser with the Purifying Face Wash as it cleans a little deeper to address your whiteheads and blackheads. The Hawaiian Cream at night is excellent because it’s very healing and great for repairing your skin. BTW, our annual 15% sale starts this Friday and goes until October 4, 2015, so this is a great time to get started on our line. I think #5 sounds like a great fit for you! Since I had stopped using proactiv on my face, my skin is going from worse to worse everyday, it is dry, flaky, red. It had lost all natural oils. Kindly suggest a remedy so that I can come out of trouble. It has been pathetic for me since I stopped using proscribe. Okay thanks, kindly tell me the skin care program I should use to restore my skin ‘s moisturer barrier. Hi! I am 18 years of age and have really dry irritated sensitive skin. This hadn’t started until I reached my teenage years. It seems that everytime I walk long distances sometimes not even more than 10-15 minutes my skin started to swell up and itch really badly. I feel like I’m a bother to all my friends because of this because they want to go walking but I can’t because I have this really bad skin condition that I don’t even know what it is. I’ve tried several calming lotions and they don’t work. Everytime I come inside from a walk my legs are red,swollen itchy and irritated. It once didn’t calm down until after 10 minutes of tears, itching ,and having to get in the shower to calm it down. The only way to calm it down for me is if I put my legs in front of some heat. It calms it down but is it really helping it? I don’t know. Please help me know what this is and what I should do. Thank you! It sounds like you need to see a dermatologist to have them determine the cause and the solution.